On the left is a snapshot from small part of the courtyard of the Wawel Castle in Cracow. I revisited this city, I liked to go there since I was in my late teens. When I was a child, like every kid I read the legend about the dragon, which is actually a founding myth of the city of Cracow. And the dragon's den is still there, the cave at the Wawel Castle Hill, open for the tourists to walk trough its dimly lit entrails, than coming out to the light at the other side, toward the Vistula River. It would be a perfect initiatory cave for pre-Christian pagan worship including symbolic death and rebirth. Only a part is open for tourists, the rest is the domain of the scientists, also the rare small animals living there.Would be also too difficult to pass through, even though the names such as "Coronation Hall" could be enticing. In the founding legend the terrible dragon lived in this cave, and the voracious beast terrorized the people who needed to give him lots of cattle as an offering every week. When the dragon wasn't satisfied, he used to devour humans also. The latest version, if I am right dating from the XVI c. says that a clever shoemaker apprentice decided to slay the monster. No one really believed that he would come back alive, but he did. 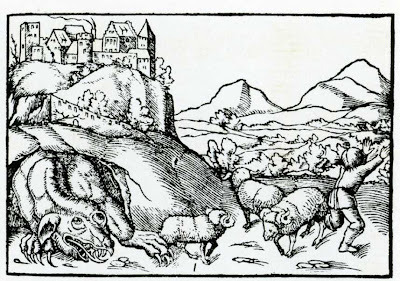 He filled a sheep skin with sulfur and gave to the hungry dragon. The beast devoured it in an instant, and felt very thirsty right away. The dragon went to the river and drunk, and drunk, but his thirst was not possible to quench. He drunk so much that his belly exploded, everyone was saved, and the courageous and the clever young man was elected the leader of the tribe. In the other version the savign hero, Krak, when he died after prosperous reign, thankful people with their own hands and effort created a mount, still in Cracow, kurghan -type construction. But archeological excavation of the kurghan (usually a grave mount) didn't result in any finding of an ancient burial. The older version of the legend, not much known, as was less flattering.This relation dates from the XII c. and was written down by Kadlubek, the early chronicler, and involves two sons of the tribal leader Krak. The brothers killed the terrorizing beast the same way as the shoemaker's apprentice did, but one of the brothers killed the other, hungry for power. As he returned he told his father that the brother was killed by the dragon, and as a hero he became the new tribal leader. But in two years the fratricide was revealed, and he was expelled from the community. Wanda the princes became the ruler instead, and she also lead army to battle against invading Germanic powers. The legendary Wanda and the versions of the legends about her was used as argument supporting the reign of some of the female monarchs in Poland, but sadly also became a part of anti- German sentiments fueling XIX c. Polish nationalism. Wawel Hill was inhabited already during the stone age, and pagan temple was close to the Vistula river.Cracow was neighbouring the Moravenses terra Moravia, the short-lived Kingdom of Moravia. First mention about Cracow as a city comes form X c. and the city than was ruled by one of the Přemyslids, a cruel prince who was indeed charged with fratricide.He was the descendant of legendary princes Libuse, and here we come to another ancestor named Krak. Krak, or Krok was also mentioned in Czech chronicles as father of three daughters, one of them, Libuse became the legendary founder of city of Prague. She was also the matriarch of the Přemyslid dynasty which ruled until XIV. c. and had a flaming she-eagle as their family crest. Prague is still the capital of the Czech Republic, Cracow was the capital of Poland until the end of XVI c. when Warsaw became a seat of Polish kings and place where they were elected. In general in early history Cracow was thriving, until the ravages of the war with Sweden which was called the Deluge, as created as much destruction as WW II, and big parts of the Wawel Castle were burned and looted. Some parts of the buildings at the Wawel Hill were not rebuilt anymore, but still the place has a lot to offer. It was a castle of proud monarch who wanted to show their glory. Wawel Castle was occupied by the Nazis, and in German also can be described as Wawelburg, (Wawelthe name, Burg is castle, German combined words). But is not the same as the Wawelburg the rumored place of the Holy Grail of also rumored Nazi mysticism. But Wawel Castle has visitors who are searching for the energy of the mystical stone, to the annoyance of the Wawel Castle personnel. Dragon legends were common in Europe, (and not only there). The dragon of Wawel Castle is one of the main figures in the founding myth, and three is also the theory that Kadlubek just wrote his version of the legend about Alexander the Great battling a dragon, as this legend was very popular during the Middle Ages.Kadlubek was educated in Italy and France, where the legend was popular, known as The Romance about Alexander the Great, based on writing by pseudo-Callistenes. So, we don't know if this was truly a legend in local oral tradition, or Kadlubek's embellishment. The old architectural details of the Wawel castle show dragons, also two churches at the Wawel Hill were dedicated to St George and St Michael, the known in Christian legends as dragon slayers.Churches were not rebuild anymore, just parts of the walls are still remaining. And at the entrance to the Wawel Cathedral, on the left, are hanging bones of a mammoth and a whale which were presented and believed through the ages as the true and real bones of the dragon himself- until the development of more modern of sciences. The pictures of St George and St Margaret, both victorious over dragons, are also present. Dragon was a symbol of evil, in iconography. But the Slavic dragons also have their peculiarities, and while for ex. the crest of Moscow has St George slaying dragon, another Slavic capital, Ljubljana has a protective dragon in its crest. Also quite a number of cities have dragons in their crests, not slayed, just being themselves, as they were also believed to be benevolent. But also Arthurian legends were adapted in Poland, and wivern the green dragon of King Arthur becomes the heraldic animal of the Piast princes of Czersk, visible on seals, crests of cities and towns, also appears on coins. This article is in Polish, but shows the crests with the green wivern. See wiverns in Poland. Czersk line of Piasts died out in XVI c. Unusual phenomenon in heraldry, as the dragon as such was clearly a negative symbol then. 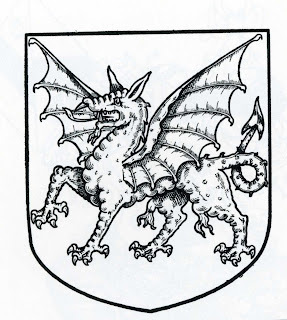 Dragon appeared also as crest of the voivods of Transylvania during the XIV c.
According to scholar from Maria Sklodowska-Curie University in Lublin, Wojciech Gorczak, Polish heraldic symbols are not well known in Europe, and a common misconception is that the wiverns appear only in the heraldry of British Isles, as connected to the Arthurian legends. Gorczak quotes sources where the King Arthur is called "the highest dragon," and of course the dragon is the symbol of the ruler himself. So, quite positive. 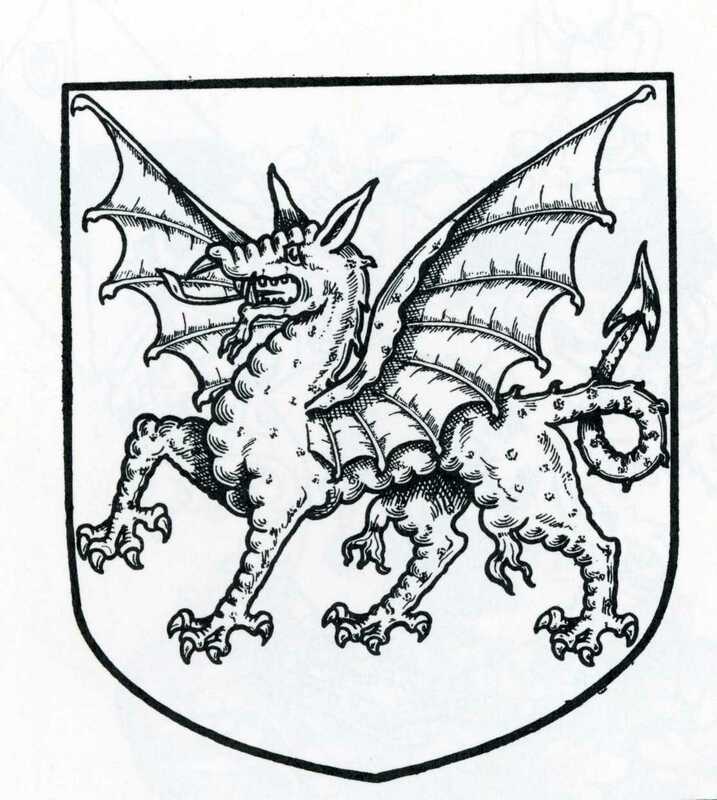 But also dragon in the same form, but different color as King Arthur's is the symbol of the Mazovian Piasts of Czersk, and became also a territorial symbol.Gall the Anonymous, the chronicler used the word draco-dragon, describing the ruler of Czersk. In Europe only in the Arthurian legends the ruler is described as dragon in a positive manner (King Arthur as dragon) and the Piasts of Czersk. By the way, the Excalibur-like sword is included in the Polish verion too. In addition Gorczak found that in the old chronicles form the XIII c. are quite number of similarities with the Arthurian legends, and the Grail story. Presence of Holy Grail legend and place bound with it I mentioned only shortly before in another post. It seems that Poland had a phase of adaptation of Arthurian legends, and some real historical rulers were personifications of common ideas of the romance literature. If you are interested to know more, here is the article by above mentioned scholar, in Polish. Google translator makes funny mistakes, like for example making Industry from the name Przemysl, or Monet is instead of coins, but Polish is complicated. It is easy to understand what the article is about. Interesting how the stories were adapted. Interesting how the rulers were eager to present themselves, or the chroniclers were eager to present them as fitting the ideal of the Arthurian romance.